Created in 2008 by entrepreneur Eric Ries, the Lean Startup Methodology is a set of principles on how to be a successful entrepreneur. Based on a set of five core principles, the Lean Startup Methodology teaches entrepreneurs how to develop products and business models quickly. Lean Startup Methodology teaches that you should build your product as quickly and cheaply as possible in order to validate, iterate, and pivot as quickly as you can. If you spend enough time iterating and focusing on your early customers, the risk of failure decreases. The central idea to the Lean Startup Methodology is the Minimum Viable Product (MVP). 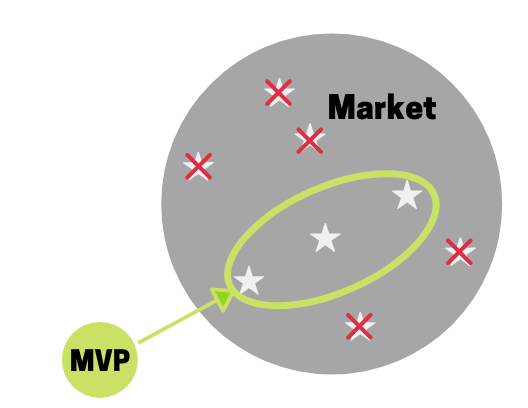 An MVP is a product with the fewest features and capabilities needed to sell the product to early customers. Essentially, this is a minimum feature set that allows you to perform a test on a hypothesis: to figure out if your product will actually work in the market. With an MVP, the Lean Startup Methodology teaches that you can refine your product, go to market, and understand your customer needs at an earlier stage in your company, by failing fast, and learning faster. Every entrepreneur starts with a problem and an idea. And most entrepreneurs, being ambitious people, have tons of ideas about how to execute their solution. With all those ideas floating around in your head, you really have to focus on finding your Value Proposition and CORE Value. 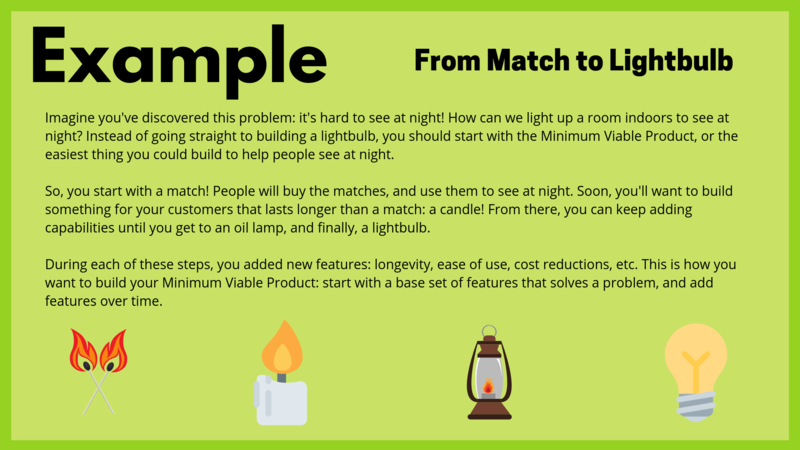 Once you’ve discovered your CORE Value, you can build your Minimum Viable Product. Since the idea behind an MVP is to find the product with the fewest features and capabilities needed to sell the product, defining your CORE Value and Value Proposition will be essential to deciding which features and capabilities to build first. 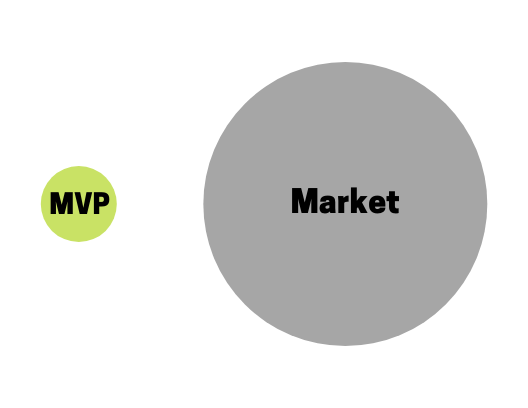 If you start with an MVP, your product will go to market sooner. If your product goes to market sooner, you can more easily develop proof points that will prove your ideas to both your customers, encouraging more purchases, and your investors, encouraging more investment. If you start with an MVP, you can gather proof points for your product that will help show others its value. Is Lean Startup Methodology Right For Me? Maybe! Each entrepreneur has to choose their own way to start their business. While developing an MVP will be the right path for some founders, it won’t be right for others. MVPs are particularly seen as being beneficial in the software and tech industries while being less applicable outside of that. After all, it’s hard to come up with an MVP for a piece of clothing, or a dry cleaning service (although, not impossible!). Ultimately, it’s up to you to decide if the Lean Startup Methodology is the right way to start your business. There are some great resources at the bottom of this page for learning more about the Lean Startup Methodology, MVPs, and how to iterate on your product effectively. Here at Startup Secrets, we actively support the use of the Lean Startup Methodology and other methodologies for some businesses, but we do have some things to add. In addition to focusing on the Minimum Viable Product, we suggest you focus on what we call the MVS: your Minimum Viable Segment. If you’re going to change the world with your startup, here’s our first secret: pick a big fight! If you go after a small market, it’s hard to become a large company. Instead, think big and disrupt a large industry! As a startup, you can’t go after a massive industry all at once, though. With limited time, money, and human capital, you need time to build up your business, your product, and your reference-ability. To do that, you need to start with your Minimum Viable Segment (MVS). What is a Minimum Viable Segment? 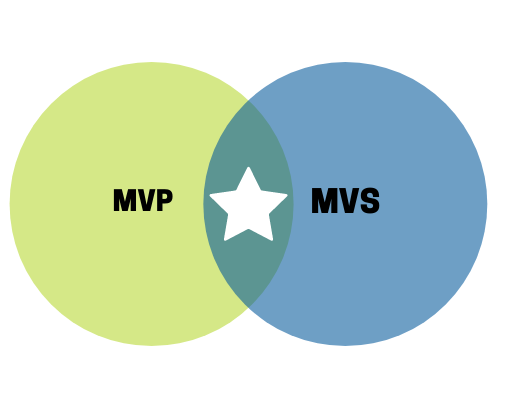 An MVP is a great way to start building your product or service. 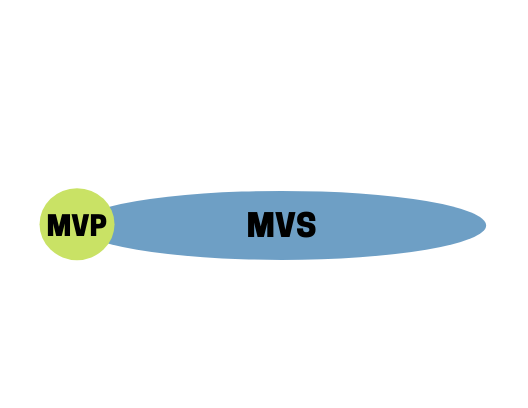 But how do you build an MVP without knowing who you’re building it for? 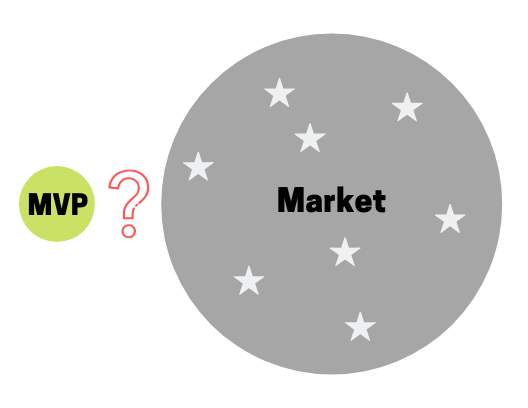 How do you introduce your MVP to the market? Where do you find your first customers? Who do you market to? You may have heard of segmenting your market. Segmenting your market means you divide your potential customer base into pieces so that you can market to them effectively. But when you’re first starting out, even this seems overwhelming! How do you divide your potential customers into segments when you’re not even sure who those potential customers are? Imagine all these stars (☆) are potential customers. You could go after all of them at once, but you’ll be spending a lot of resources trying to reach them. So, how can you use segmentation to get your MVP into the market and start building a reputation? 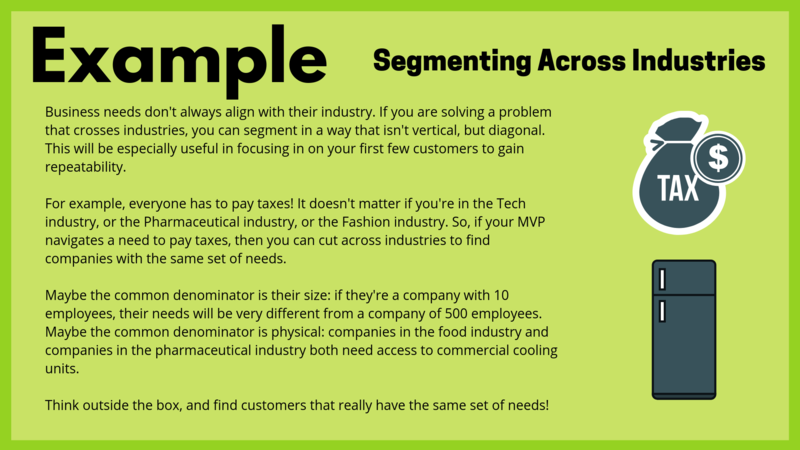 In order to be effective, you need to find your Minimum Viable Segment (MVS). Just like your MVP, you need to think about the ways in which you can reach the right group of people with the right product at the same time. Here’s a tip: your MVS does not have to live in the same vertical. Those first potential customers need to share a set of needs but don’t necessarily have to be in the same industry, although they can be! At Startup Secrets, we call this a diagonal: a group of customers that cuts across industries but functions as your company’s segment. The important thing here is to find a set of customers that allow you to build your MVP as minimally as possible. If you try to build an MVP for customers with wildly different needs, your product will end up being unfocused and too difficult to build. Your sweet spot is right where the star is in the image above. 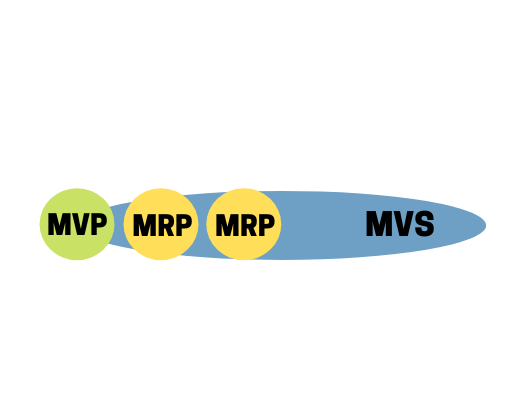 You want to build an MVP for a defined MVS, so you can really focus in on the right product. If you don’t focus, you will find yourself wasting resources on building unnecessary product features, or going after customers whose needs you just can’t meet in the beginning stages of a startup. "“It’s better to expand on success than contract on failure." What do we mean by this? Start small. It’s better if you focus your original product and segment, and expand when you succeed. If you start out too big, your chances of failing are higher, and you’ll contract when you fail. At Startup Secrets, we want you to succeed! So, focus your MVP and MVS as closely as possible to eliminate waste and give yourself room to grow as you gain more customers. This doesn’t mean that you don’t go after a BIG market! As we stated earlier, it’s best to pick a big fight. In order to focus, you need to find your MVS, and then take it one step further: targeting specific individuals inside of a “diagonal” that will help evangelize your product once you’ve provided a solution to your customer. Think about targeting like an actual target: if you hit anywhere in your target, or anywhere in your vertical, you’re off to a good start! We said earlier that targeting based on size helps you refine even further. 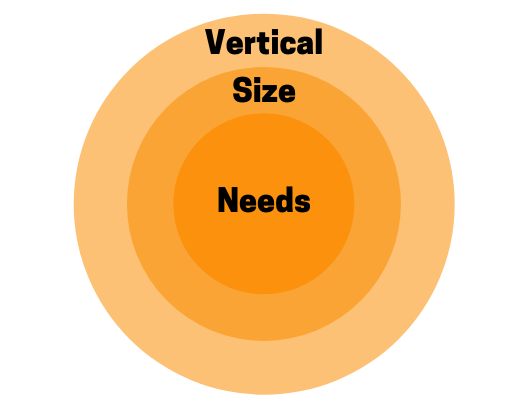 But what you really want is that bullseye: the same set of needs within similar-sized companies in the same vertical. For example, if you’re building a product for the medical industry, you can really refine who you’re building the product for. Once you’ve decided you’re building for medical professionals, you can ask yourself: am I building this product for field workers or office workers? In services or in sales? Services for medical equipment, or office equipment? In private practices, or in hospitals? In diagnostics, or in critical care? You can see here that we’re getting smaller and smaller targets with every step we take. The smaller the target, the easier it is to gain a larger market share, quickly. From there, you can expand on your success! If you try to build an MVP for a segment that isn’t minimal, you won’t end up with a very minimal product at all. Targeting and refining your MVS will help you grow a product that is referenceable. And being referenceable by your early customers is critical!!! You want your early customers to tell other customers who have the same need, “Wow - they really nailed it!” When Customer 2 calls Customer 1, the first thing they’re likely to do is determine whether or not their needs are the same; if they’re not, it’s short call and you’ve lost the opportunity to have your customers sell for you. Whereas, if you’ve nailed the MVS correctly and the customers all have the same need within that segment, they’re way more likelky to become your greatests advocates, helping you dominate that one segment and then expand from there. Additionally, targeting and segmentation can factor into your unique differentiation. Disrupting an industry isn’t just about having a new product or technology that no one has ever invented before. Instead, if you’re navigating a space where large players already exist, try going after a segment that isn’t being served. Your product will be adopted much more easily than if you try and take over space where an enterprise already dominates. Being able to focus isn’t the only reason to build a solid Minimum Viable Product, or to identify your minimum viable segment. While focusing reduces waste, which is the principle of the Lean Startup Methodology, your MVP and MVS will also help you expand much more quickly. How does it help you expand quickly? Great question! Once you have an MVP, and a few customers in your MVS have signed on, you will start expanding your features and capabilities. With a small segment and a small product, you can easily learn from customers to find which features are most important, and what the next steps are for your product. What you’re really looking for at this point is uncovering your Minimum Repeatable Product (MRP). Your MRP is the next step in your journey as a startup. With a small set of customers with the same needs, you can uncover the best ways to handle their problems much more quickly. You will start adding new features and capabilities, making a more robust product that serves as a full solution. Once you have a Minimum Repeatable Product, it will become your Minimum Referenceable Product as well. Referenceability comes when a group of people with the same set of needs will start recommending your product to other people. Word-of-mouth references are one of the best ways to start expanding your market, as you start to get inbound interest in your product. When you get inbound interest, you can continue to build on your product, adding more and more features until you can reach customers outside of your Minimum Viable Segment. Why is referenceability so important? It will help you refine and expand upon your go-to-market strategy. It will allow you to understand your pricing and packaging. It will help you find channels along which to distribute your product. It will streamline your messaging and communication. Your referenceability and repeatability are the necessary final steps to creating a full solution to the original problem you set out to solve. Finding your Minimum Viable Segment is critical to starting off strong with your business. Check out lessons on Focusing on your CORE Value and Value Propositions for more on building your initial product. As always, check out our forums if you have any questions, or just to connect with other entrepreneurs! For more on MVP and MVS, see our workshops on the Roadmap to Success, Go-to-Market Strategies here and here, and Turning Products Into Companies (at 44:20 and 47:45). What the Hell Does Minimum Viable Product Actually Mean Anyway?